And just think, we get to pay more in fare in February and still endure this crap behaviour. Living in Ottawa, I thought I was relegated to reading your blog to get my daily dose of donkey disobedience. Sure, Ottawa has the O-Train, even equipped with quad seating, but the average ride is only 7 minutes and the longest 20. There just isn't a huge incentive to put one's feet up on the seats, and the short trip makes the occasional bag rider a non-issue. Generally it's an enjoyable experience. This all changed this week however. With the snow, suddenly everyone has the irresistible urge to wipe their slush covered feet off on the edge of the seat across from them. Getting pictures has been a bit of a trick, but I have finally managed to capture my greatest infraction yet. Of course it was a bit sunny but I think the picture shows it. Three girls (all wearing UGGs of course) were sitting in a quad. The girl that is closest to the camera was originally next to the girl in the green sweatshirt. 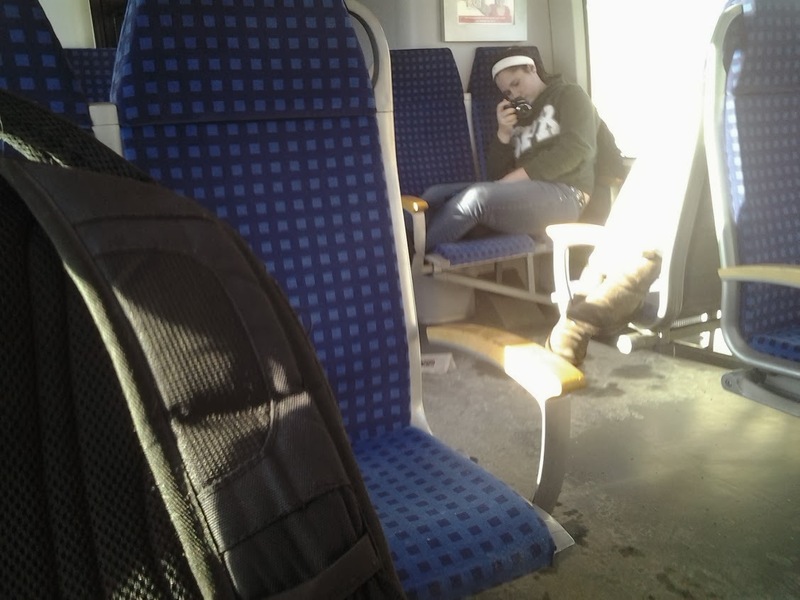 Not visible in the picture is the third girl in the quad across the aisle, also with her feet on the seat next to hers. 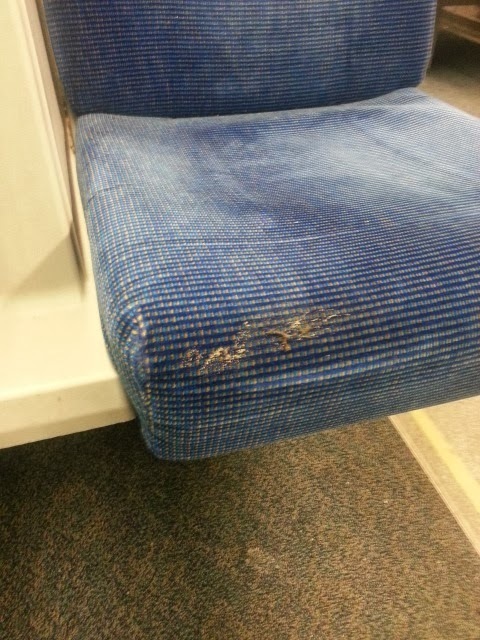 Also note the condition of the train floor, covered in salt and sand to be wiped off on the seats. I would normally place my backpack out of the way of the camera when taking a picture, but I didn't want to put it on the floor. This third girl was originally sitting across from the other two, until she discovered the extreme comfort of sitting sideways with your feet squarely on the seat next to yours (there is no central armrest like the GO BiLevels, but there is one at the aisle). At this point she was kind enough to give up her seat and move to the (unfortunately) empty quad across the aisle, so her friends could join her in stretching out for the remainder of their journey. At this point the one in the green sweater decided to document this new position with a large camera, I assume so she can share it on Instagram later. Of course the other girl in the picture was also social and broke out her phone to take a photo of her friend with her feet up while taking a photo of her with her feet up. This level of social media-ing was simply too much for me to handle and my stop was next so unfortunately I didn't see how this ended. I would bet that they never noticed the sticker between every window on the train though. 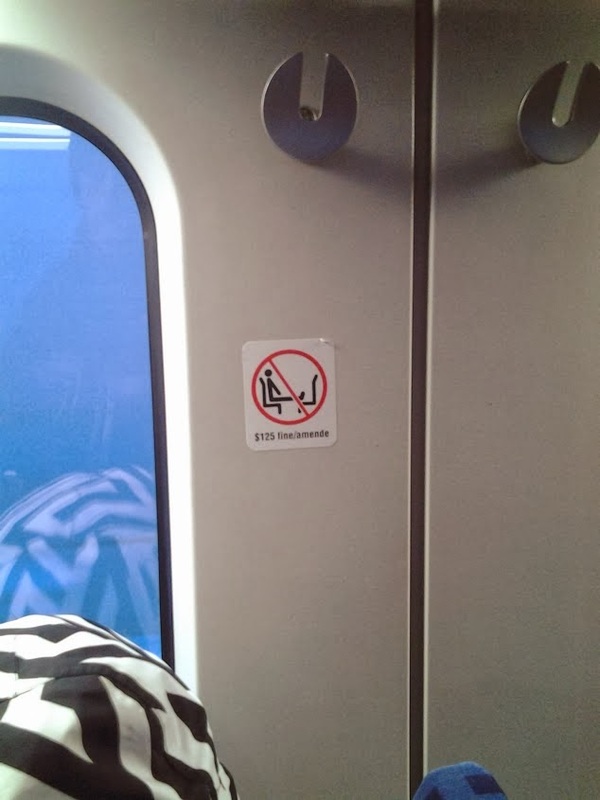 There is a FINE for putting feet on the seats!? Can you tell me how this is enforced? As for your story, I think my head exploded. Apparently there is a fine, but I have never seen a ticket issued. Like GO (I think), OCTranspo has both Fare Inspectors and Special Constables. I have only ever seen the fare inspectors on the platforms, but once the Special Constables did come through the train to check tickets, and another time they just wandered past. I imagine they would be the ones to give the tickets, but I've never witnessed it. The only staff member always on the train is the driver, and they can't issue fines. I don't doubt that they would tell a foot rider off though if they ever saw it. The good news is that there is a new plan in 2014 for the special constables to get out of their cars and actually ride the buses and trains (genius, I know). Hopefully this means more enforcement of the foot rule. And yes, I wasn't sure how to tell the story clearly. I considered giving the three girls names to make it clearer, but in the end couldn't come up with enough good ones. Princess A, Princess B, and Princess C.
And yes, I'm having a growl, grumble, grrr day today. A footnote on this Ottawa story. These Bombardier Talent train sets have been in passenger service operation since 2001 and will be phased out in 2014. New train sets are by Alstom replacing the Bombardier trains. It will be interesting to see what the seat configuration of the trains are when they start passenger service. Go has a fine but they have to catch them. I was under the impression there is no fine that any GO Transit Safety officer can issue for feet on the seat. I have been told that if the officers feel inclined, they can tell people to keep their feet off the seat but they can't issue a fine. They can, however, cite people for: vandalism, smoking, drinking open alcohol, harassment, disturbing the peace, unlawful conduct such as attempting to ride on the outside of a train and misuse of the emergency assistance system. But no, a GO cop cannot fine a passenger for feet on seats. If I'm wrong, I'll need to see where in this document http://www.gotransit.com/public/en/docs/Tariff_EN.pdf the fine is outlined unless it's a rule book passengers don't have access to but seriously, I've been on trains where fare inspections have been conducted and officers have checked the passes of people with their feet on the seat and nothing was said or done to make the passengers put their feet down. You'd think the condition some of those seats are left in would constitute vandalism. Seldom do the offenders get caught, let alone reprimanded. Feet on seat = vandalism. Of the seat and of others clothing. I agree with you but I have been on the train, in winter, with a fare inspection on-going at 10:20 pm and people with feet on the seats, clearly dirtying the seat and nary a warning, ticket or acknowledgment was made. Perhaps this is a matter to take up with the head of Transit Security. I will follow-up. Having seen one of the new O-Trains, the seat configuration is the same, mostly quads with some flip-downs in the entrances. The style of seating is also very similar, tall with similar colours. Your right C.J, Transit safety can not issue tickets for putting your feet on the seats.I would like to see them inforce the misuse of the PAS alarm strip and and issue more of the very expensive fine for pulling the conductors valve (emrgency air release) once the pasenger has realize the have boarded the wrong train , thats 20 minute delay right there.